Posted by Stefan Vorkoetter on 2 Apr 2000, 9:20 p.m. Recently, my HP-42S broke down (the "9" key stopped working) and I found to my horror that there was no way to disassemble the calculator. I e-mailed all my colleagues to see if any of them had any old HP calculators lying around, and one of them did. He gave me his old (broken) HP-19C and HP-41CX. The 41CX was more challenging, but first a bit of history. Long ago, I had an HP-41CV and one day it stopped working. I found that the CPU board is connected to the keyboard by a set of flexible connectors which rely on pressure to maintain contact. This pressure is provided by the screws that hold the calculator together, but the plastic posts that the screws go into had cracked (interestingly enough, my Braun shaver suffered the same failure on the very same day). 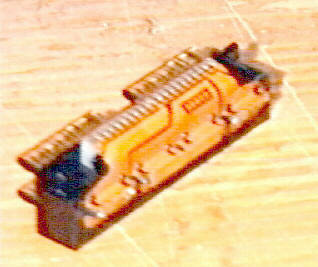 A similar arrangement connects the module back-plane and battery connectors to the keyboard circuit. The repair consisted of a few drops of cyanoacrylate glue, and a wrap of fine wire around the posts until the glue had thoroughly set. Unfortunately, a few months later, I sold the calculator since I thought I might like one of those nifty BASIC-language pocket computers better. I was wrong, so the following year my wife got me an HP-42S for Christmas. It didn't have that same air of quality that the 41CV had, but it worked fine, and I'd been using it for about 10 years now... until the "9" key stopped working. Volume 2 of the Owner's Manual (which seems to contain all the useful information, so I wonder what's in Volume 1). 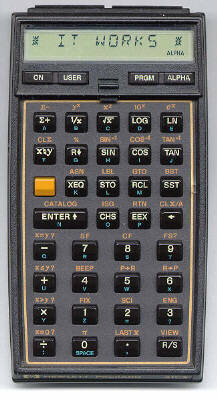 In this article, I will describe the steps I took to restore the calculator to working order. I will assume you have at least hobbyist-level skills in electronic equipment repair. I'm not an EE by any stretch of the imagination, but I've been tinkering with electronics since I was a little kid, so I don't mind taking things apart to try and fix them. This information is provided as-is, with no warranty of any kind. Under no circumstances will Stefan Vorkoetter or the Museum of HP Calculators be liable for any loss or damage resulting from use of this information. If you attempt to repair your calculator using this information, you do so at your own risk. 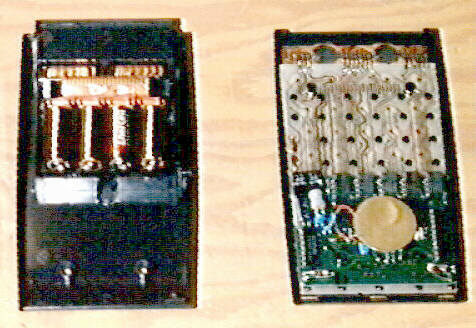 This photo shows the two halves of the HP-41CX case. In addition to the front and back case pieces, there's a 1/4 inch thick bezel which goes between the two case halves (from the outside of the calculator, it's the shiny band between the top and bottom matte finished case halves). I suspect this problem must be common to lots of HP-41 series calculators. The screw posts are under a great deal of stress, since they must hold the machine tightly together. Any jolts received by the calculator take their toll on the screw posts. Over time, they're bound to weaken and crack. If cracked posts were the only things wrong with your HP-41, you can now reassemble it. Reinstall the frame and flexible interconnects and slide the CPU board back over the posts. Place the black plastic insulator sheet over the keyboard. Put the bezel on the front half of the case (note that the bezel is slightly narrower on one side than the other; the narrow side faces the front of the case). Place the back case onto the bezel, and screw everything back together (the short screws go in the bottom holes). Tighten the screws securely, but do not overtighten them. Reinstall the battery pack and turn it on. If all is now well, the calculator will display "MEMORY LOST". The first step is to mount the calculator to a convenient surface, and then mount the CPU board next to it so that the wiring can be carried out. Here, I've taped them both to a board. 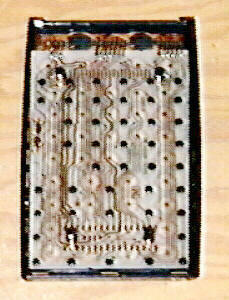 Overlap the CPU board on the bottom of the calculator, component side down, as shown. Be sure to orient the board correctly. 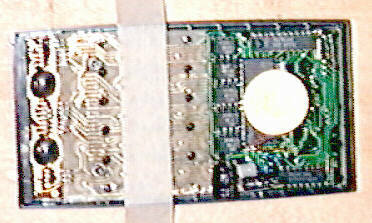 Start by tinning all the conacts on the keyboard and CPU board using a fine-tipped soldering iron. Cut 16 pieces of 30-gauge wirewrap wire to the appropriate length to reach from the bottommost contacts on the keyboard to the corresponding contacts on the CPU board. 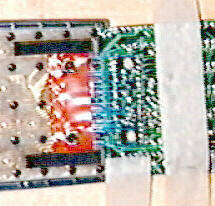 Strip 1/8" of insulation from each end of each piece, and solder the 16 wires between the appropriate contacts as shown. Next, cut 4 pieces of wire of the appropriate length to reach from the middle row of contacts on the keyboard to the corresponding contacts on the CPU board. Strip 1/8" insulation from each end, and solder them in place as shown. Now it's time to move on to the final row. Cut 14 pieces of the appropriate length to reach from the top row of contacts on the keyboard to the corresponding rows on the CPU board. Strip 1/8" insulation from each end, and install them, omitting the two locations that are blocked by the screw posts. Cut two additional pieces about 1/4" longer to to connect the remaining two pairs of pads. Route these wires around the screw posts (and the screw post holes in the CPU board), and solder them in place. The next step is to reinstall the CPU board on the keyboard. Before doing this, cut a piece of electrical tape to the same length as the CPU interconnect frame that you removed, and punch two holes in it to clear the screw posts. Also glue some 1/8" thick foam rubber to the keyboard circuit board at the two ends of the tape to hold the CPU board away from the keyboard once it's reassembled. 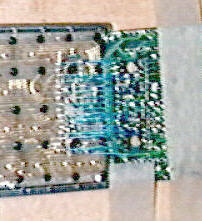 At this point, if there's nothing else to repair, you can reassemble your HP-41 as described in the previous section. You might have to trim a half inch or so off the bottom of the plastic insulator sheet to clear your foam rubber strips. You may also find it a bit harder to tighten the bottom screws because the wiring and foam padding might provide some resistance, but they will give. Just be careful when tightening not to strip or crack the screw posts. There are four battery contacts. 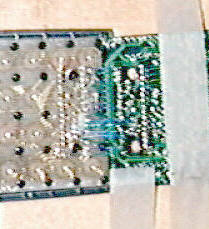 When viewed from the back of the calculator, with the module ports at the top, the leftmost contact is the negative one. The rightmost is positive. The two in between aren't connected to anything except each other, and are just used to connect the two middle cells to one another when the battery pack is in place. The battery contacts are part of the module port back-plane, and the whole assembly is just a friction fit into the back of the case. It's fairly easy to pull out to work on it. I cut out a 1/8" wide strip of thin brass strip (available at any hobby shop) wide enough to span the two middle contacts, and glued it across them with cyanoacrylate. This strip now serves to connect the two middle cells. The photo at right shows the end result. It's a bit fuzzy, but if you compare it to the back-plane from your calculator, you can see that the middle two battery contacts have been bridged, and that new contacts have been soldered onto the outer two. After several hours spent repairing the 41CX, I put it all back together, installed the battery, and was greeted by a "MEMORY LOST" message. A quick test revealed that everything was working. I also tested the card reader that came with the calculator. It seems to work most of the time, although it sometimes makes funny noises and gives an error message while reading. I intend to open it up and see what's wrong in the near future. I then proceeded to give the machine a thorough cleaning. I used a very slightly dampened rag to clean all the keys, and the spaces between them. After a few minutes, I had a good-as-new HP-41CX. In some ways, it's actually better than new, since it no longer relies on pressure to maintain the critical keyboard to CPU interconnection. There are still a few things that need to be fixed. The cover for the charging jack is missing (although the calculator didn't come with a rechargeable battery). One of the port covers is missing (the card reader was plugged into it when I got it). The ALPHA key sometimes bounces, acting as if I'd pressed it twice in a row. And there is a strange little pair of bumps on the right side of the keyboard, next to the SST key (see the close-up photo). If anyone can tell me what that might be, I'd appreciate hearing from you. Well, that's all that I needed to do to get this calculator working again. If you take it a step at a time, it's really not very difficult to do. Just be careful, check all your work as you finish each step, and your chances of success are very high. On the other hand, if you're not comfortable disassembling electronic equipment or working with a soldering iron, you might be better off getting a more experienced friend or colleague to help you out.